Animal Costumes Blog: A Bunch of Monkeys! What a bunch of silly monkeys! 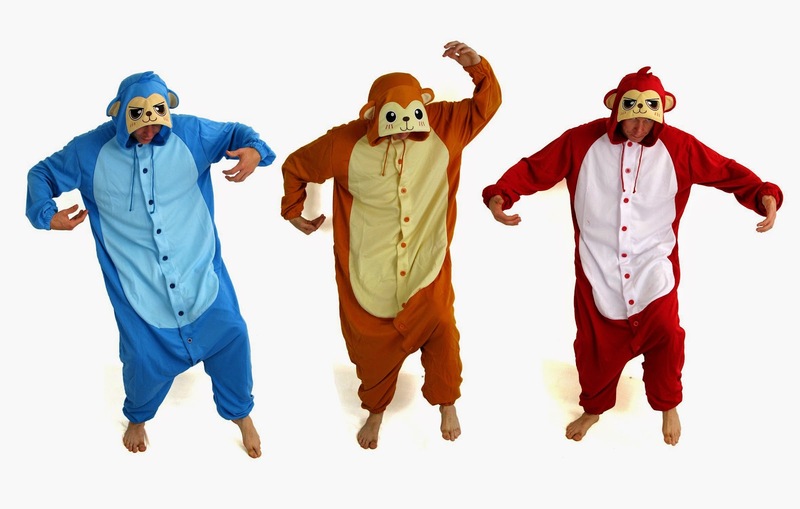 We've just launched three new costumes on our Animal Costumes Shop website, and all of them are monkeys! Or apes, technically, because one of them is an orang-utan. They're all available in three adult sizes and all of them are completely hilarious. So named because it is a monkey, which is blue, blue monkeys live in East Africa, and probably the moon. And Uranus. They like to eat blue bananas and blue cheese, and they drive blue cars and their favourite musical genre is, erm, jazz. This is the orangutan, or a generic orange monkey if you prefer. Orangutans enjoy their status as both the most chill and the wisest of all of the apes. They live in Borneo, which is actually two places, and they are most well known for scoring really highly in their SATs and for their mildly successful careers in advertising fizzy orange juice. The red monkey is probably the cheekiest of all of the monkeys, which is really saying something because monkeys can be really cheeky, legend has it. Some monkeys are natural red-heads (and red-bodies too), but some just get themselves spray painted. It's hard to tell these days.